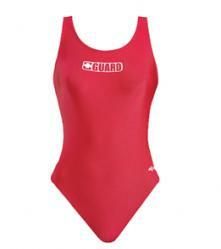 Dolfin Solid Female HP Back swimsuits are a top choice for many lifeguards. Dolfin Lifeguard products are designed with everything in mind from coverage and comfort to UV protection and durability. 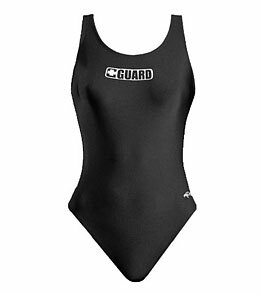 This wide strap design one piece offers a long-lasting fit with its Nylon Spandex material, flat seam construction, and athletic cut back. It is sure to keep you looking good and feeling great on those long days on the job. Includes a Guard logo on the front chest. Dolfin offers many options within the same low price range. With four colors to choose from, the Dolfin Solid Female HP Back is a popular swimsuit for lifeguards and swim teams alike!